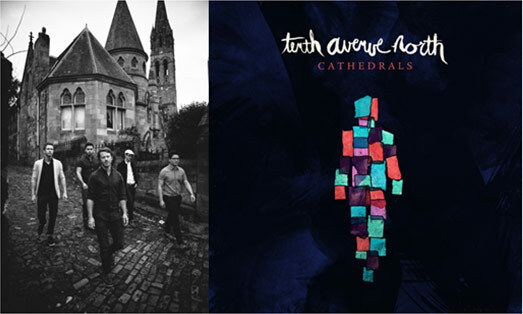 Provident Label Group announces that Tenth Avenue North will release its fourth studio album on Reunion Records (a division of Sony Music) on November 10 titled Cathedrals, with a deluxe version also available, containing four additional bonus tracks. Tenth Avenue North’s first Christian radio single from the album, titled “No Man Is An Island,” debuted in the Top 20 on the National Audience Chart and is currently in rotation in key markets and networks including K-LOVE/Air1, The Fish, SiriusXM, Chicago, Dallas, Atlanta, Tampa, Cincinnati, Las Vegas, Minneapolis and Seattle, among others. In anticipation of the full-length project debut, Provident Label Group surprised fans with a special Islands EP featuring four bonus tracks, including the single “No Man Is An Island” which was released digitally in July. Coinciding with the EP, an exclusive music video for “No Man Is An Island” also debuted on K-LOVE (check it out here). Throughout the year, the band has also offered fans exclusives and insider content every tenth day of the month (#Tenthonthe10th), culminating with the month of October. Aptly renamed ‘Tenthtober,’ Tenth Avenue North will be sharing fan-focused content every day of the month. The Dove Award-winning band’s fourth studio album is a collection of well-crafted songs that inspire community, encourage accountability and celebrate the fact we are not alone. Produced by John Fields, known for his work with the Switchfoot, Jonas Brothers, Demi Lovato and Pink, Cathedrals was written while the band was out on the Winter Jam Tour, setting up make-shift recording spaces in locker rooms and green rooms around the country. Donehey, drummer Jason Jamison, bassist Ruben Juarez, keyboardist Brendon Shirley and guitarist Jeff Owen have forged a unique sound that has made them one of the Christian music’s most successful young bands. In the spring of 2014, Tenth Avenue North crossed the one million mark for records sold and continues to build its strong fan base by achieving more than one million likes on Facebook. Performing regularly at diverse venues across the country, the group has a full national tour lineup scheduled throughout 2014 in support of the album that includes two headline fall circuits (From Islands to Cathedrals and Cathedrals tours). Provident Label Group, a division of Sony Music, whose labels include Essential Records, Reunion Records, Essential Worship and Beach Street Records, is home to an artist roster which includes Casting Crowns (Thrive), Third Day (Miracle), Tenth Avenue North (The Struggle), Red (Release the Panic), Brandon Heath (Christmas Is Here), and Royal Tailor (self-titled) among others. Provident Music Group consists of Provident Label Group, Provident Films (“Mom’s Night Out,” “Courageous,” “Fireproof”) Provident Distribution, Essential Music Publishing and Essential Artist Services.